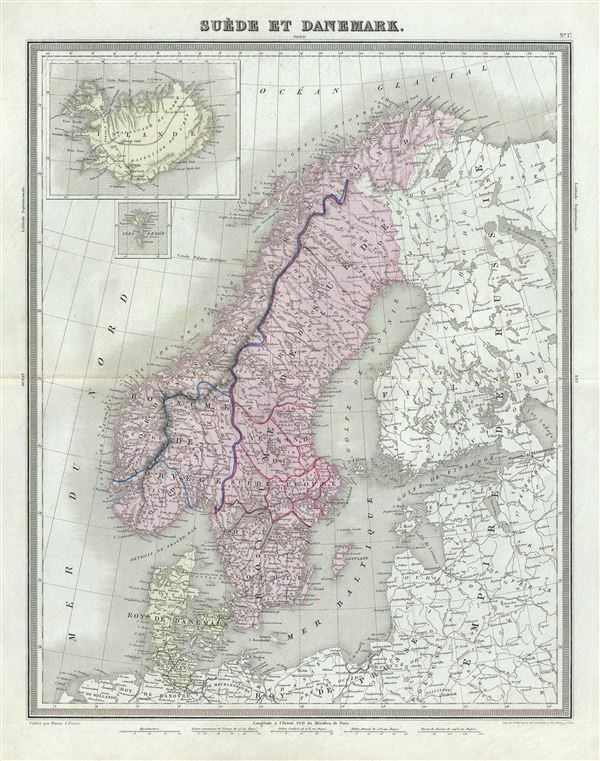 This is a beautiful 1874 map of Scandinavia, including Sweden and Norway by Ambroise Tardieu. It covers from the Arctic south to the Baltic Sea and east as far as St. Petersburg. Two insets in the top right quadrant detail Iceland and the Faroe Islands. Throughout, the map identifies various cities, towns, rivers and an assortment of additional topographical details. At this time in history, Scandinavia was in the midst of a prolonged period of peace that led to a cultural and population boom, especially in Sweden. The economy however could not keep up with the increase in population and much of Sweden's population immigrated to the United States between 1850 and 1910. This map was prepared by Ambroise Tardieu and issued as plate 17 in his 1874 edition of Atlas Universel de Geographie Ancienne et Moderne.